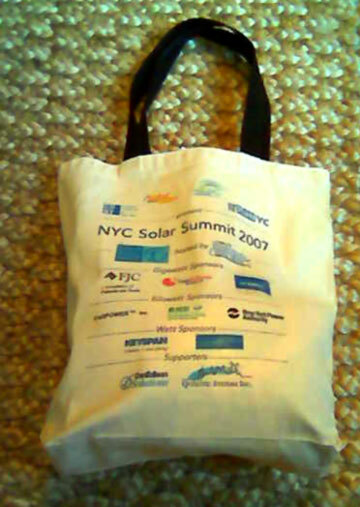 Browse: Home /	ENERGY SOLUTIONS, Renewable Energy / Solar Summit 2007: Power, Policy, and a free (NOT Plastic) Bag! Yesterday I attended the NYC Solar Summit 2007, sponsored by CUNY’s Center for Sustainable Energy. The event’s focus was on how to enable the growth of solar power as a renewable energy resource here in NYC, discussed from many angles. I will try to provide a more in-depth report later, but first I just HAD to post a photo of the lovely NOT plastic bag given to all participants, with no three-hour wait!